Today I started making my own boro cloth. Not by repairing something I already have but by combining sample pieces of indigo dyeing done by my Indigo Sisters and me, pieces collected when I was in Japan this time last year. Judi brought pieces she had dyed in various shibori designs at home, Nat dyed indigo moons, Carin gave me a sashiko piece to stitch in my spare time (ha ha), Blandina gave me silk threads, we all cut our own katazome stencil and dyed sample pieces. It seems appropriate to join all these together, with hand stitching, to make a souvenir cloth in the style of Japanese boro. All the small pieces that could get lost somewhere in my sewing room will become a whole. You might remember that I wrote about visiting the Amuse museum with Carin where we enjoyed a magnificent collection of Chuzaburo Tanaka's boro and of visiting Amy Katoh's exhibition of boro with Julie. Boro is a Japanese word meaning “tattered rags” and it’s the term frequently used to describe lovingly patched and repaired cotton bedding and clothing, used much longer than the normal expected life cycle. Like early North American patchwork quilts, boro textiles revealed much about the Japanese family's living standards and the nature of the economy of their time. The penny-wise Japanese rural wife repaired the family’s sleeping futon covers again and again by “boro” patching fabric scraps over thin areas and holes in the fabric. Adding sashiko sewing to the repair gave greater strength to the material. 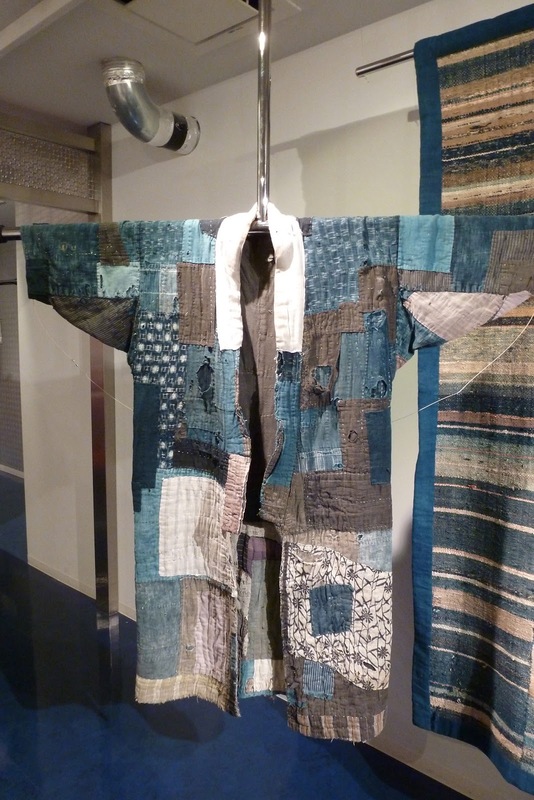 Today international collectors regard boro textiles as uniquely Japanese and striking examples of a bygone and lost folk craft. The same sewing technique that was used to repair boro futon covers was also put into practice when repairing noragi (farm clothing). This was done in order to increase the lifespan of the clothing and add extra layers of fabric thickness for warmth. At the time when Japan was struggling to recover from the devastation of the Second World War, the Japanese regarded boro textiles with great shame in that these utilitarian textiles served as an open reminder of Japan's impoverished past. 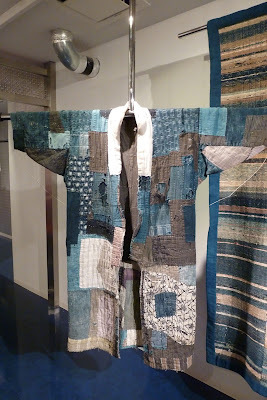 Currrently, these same textiles are cherished and collected for the stories they tell and the windows they open into Japanese folk culture and history." I wonder at what point my husband would be upset over my use of those patching techniques. The war years have left many Japanese rather raw...even to the extent of not switching to daylight saving time (which would certainly save power) because of its relation to the shame of war and occupation. It is always worth keeping things one does not want any longer; the next generation will treasure them. The PET soft drink bottle we recycle today will be quaint in V&A in 100 years' time. Making a Boro quilt will bring together not only all the pieces of fabric you got but also all the memories and thoughts of the people you associate them with. Looking forward to seeing your quilt, first here on your blog and then in Amuse Museum in 100 years' time, if I live to be a Tattered Boro Lady in 2113! 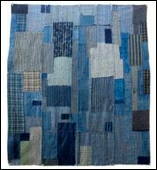 Hi Lis - I had made a large boro style quilt before going to Japan, all with handwoven/indigo dyed scraps. When I came home I made a smaller piece with our stenciled samples but I find I have to neaten seams and edges. The sashiko stitching makes a big difference to the appearance and feel of the piece. Enjoy stitching in all the memories. Many feelings brought back with this post.